Pittsburgh Steelers head coach Mike Tomlin; we love him when he’s right, laugh when he uses “obviously” repetitively and curse him when things go badly. By now, the man has got to have the pulse of Steelers Nation – right? In his pre-game conference ahead of the Steelers’ final preseason game against the Carolina Panthers, the ol’e devil went and did something that practically animated the throwback jerseys hanging in the back closet like zombified bees swarming a hive; he told everyone that any player on the roster that may resemble a ‘starter’ won’t see time on the field. Say, what? There will be a lot of established guys that won’t play or will have very limited participation in this game. We are still outlining that as we sit here, some of the division of labor, who is going to play and what. Again, this time of year, particularly on a short week such as this, a lot of those decisions get made at the eleventh hour. But rest assure we are going to rest some established guys, but more than resting them we are going to provide an additional opportunity for those who are fighting for opportunities. 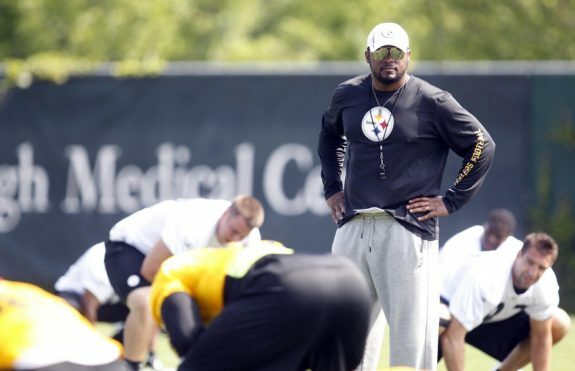 Tomlin may be crazy as a fox in changing from what many teams do in their final preseason games: getting the players into the game they believe will contribute the most during the season for one last practice run. A ton of teams have seen guys slated for their starting roster lost due to early injuries already, and the Steelers haven’t been immune either. On the other hand, watching yet another Steelers game without the favored stars likely ranks low on what Steelers Nation was hoping for. This will be game number five and so far, the preseason has been underwhelming to view. 2015 has proven interesting in how the coaching staff in Pittsburgh has approached games as evaluations rather than competition against opponents. The move has drawn heavy criticism from some and a confused disdain from others. I have spent the past few weeks scratching my head as well. What is going on in Pittsburgh? Are they trying to look like a high school squad in a soap game? Okay, that is a bit of an exaggeration, but I think some readers will agree. Business as usual has not been what has been demonstrated thus far. Tomlin and the Steelers are in a unique situation this year. With a ton of talent interspersed with young, untested yet potentially great players, Pittsburgh is looking for a team they can field that is both competitive and consistent. To get the final product they can be satisfied with, it has taken a bit more time than most of us are used to. It may be a crazy gamble to go into the final preseason game still microscopically looking at guys who may or may not make the final roster, but it may be a really smart execution of creating the best possible team. Think of it as laying all the cards on the table. The aces will be obvious, but it may be the hidden straight flush that wins. The Steelers have had some glaring issues, especially on defense. While some may argue that deficiencies are, at least in part, due to starters not being played together in preseason games and creating a rhythm; there is possibly an even greater need to create depth for continued development. Case in point: Cortez Allen had a bit of a meltdown in 2014 that was unexpected and forced Pittsburgh to move other guys to the front of the depth chart. Not to pick on Allen, but foresight would be to prepare for a similar eventuality should Shamarko Thomas not quite fit into the roll Troy Polamalu once held at safety or Sammie Coates need extra time to develop the soft hands of Lynn Swann at receiver. You can’t get back the stars of the past, but creating those of the future doesn’t always equate to having them handed to you in the draft, either. Tomlin may be onto something, or he could be grasping at straws. The Steelers have had identity issues in the past, but this season looks like it may need to be a paint-by-number portrait until the palette becomes a bit more defined. They are a team, not in transition, but in genesis – an evolution in creation. The master strokes have yet to be painted to call Pittsburgh a masterpiece. They say great art takes time – we hate it, but accept it grudgingly – and perhaps one last preseason game is exactly what it will take to unveil the big picture. 1 Comment on "Between the Hashmarks: Tomlin excluding Steelers starters against Carolina crazy gamble or smart execution"
Injuries are the apparent reason for this move. With Bell and Bryant suspended and key players injured, Tomlin can’t afford to lose any members of his starting unit. Besides, the backups need work — a lot of it — and the veterans hate preseason games and have already played the usual four. Anyway, this move will have zero effect on how well the Steelers play against the Patriots. Our starting defense is on the wrong side of the learning curve, especially the secondary — meaning that their errors on the field are more mental than physical. After being humiliated by Buffalo on the ground and in the air, it won’t help their confidence to be riddled again by Cam Newton and Jerricho Cotchery. No, they need time to rest up and regain their swagger in time to get riddled by Jimmy Garoppollo, LeGarrette Blount, and the entire Patriots receiving corps. And our offense needs to rest up in the hope of out-scoring the Patriots without the help of Bryant and Bell, knowing our D isn’t going to stop anyone. Tomlin is definitely making the right move in resting everyone, not because he is clever like a fox, but because he is out of options like a clam.